Supercomputer simulations at the Department of Energy's Oak Ridge National Laboratory are giving scientists unprecedented access to a key class of proteins involved in drug detoxification. Jerome Baudry and Yinglong Miao, who are jointly affiliated with ORNL and the University of Tennessee, have performed simulations to observe the motions of water molecules in a class of enzymes called P450s. Certain types of P450 are responsible for processing a large fraction of drugs taken by humans. The supercomputer simulations were designed to help interpret ongoing neutron experiments. "We simulated what happens in this enzyme over a time scale of 0.3 microseconds, which sounds very fast, but from a scientific point of view, it's a relatively long time," Baudry said. "A lot of things happen at this scale that had never been seen before. It's a computational tour de force to be able to follow that many water molecules for that long." The team's study of the water molecules' movements contributes to a broader understanding of drug processing by P450 enzymes. Because some populations have a slightly different version of the enzymes, scientists hypothesize that mutations could partially explain why people respond differently to the same drug. One possibility is that the mutations might shut down the channels that bring water molecules in and out of the enzyme's active site, where the chemical modification of drugs takes place. This could be investigated by using the computational tools developed for this research. By simulating how water molecules move in and out of the protein's centrally located active site, the team clarified an apparent contradiction between experimental evidence and theory that had previously puzzled researchers. 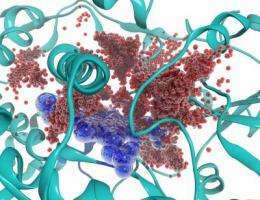 X-ray crystallography, which provides a static snapshot of the protein, had shown only six water molecules present in the active site, whereas experimental observations indicated a higher number of water molecules would be present in the enzyme. "We found that even though there can be many water molecules -- up to 12 at a given time that get in and out very quickly -- if you look at the average, those water molecules prefer to be at a certain location that corresponds to what you see in the crystal structure," Miao said. "It's a very dynamic hydration process that we are exploring with a combination of neutron scattering experiments and simulation." The simulation research is published in Biophysical Journal as "Active-Site Hydration and Water Diffusion in Cytochrome P450cam: A Highly Dynamic Process."